Stage 6 is behind me. 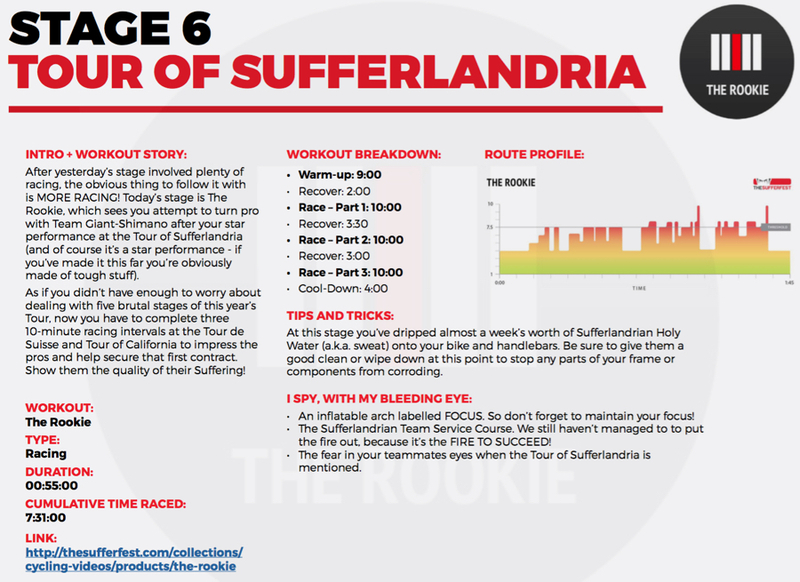 Only three more stages to go on this Tour of Sufferlandria. Strong on the bike this morning. I did load up on carbs last night and went to bed at 9:30pm so perhaps that helped. I still have some legs. Three more stages though. And the last two are brutal. A friend reminded me that some races can be even more brutal than the Tour of Sufferlandria. Take stage three of the Volta La Marina in Benidorm. The riders were literally blown off their bikes. Some tried to continue by putting their feet down to keep moving. Is that suffering? Putting your feet down during a race?? InÂ the Tour of Sufferlandria, we keep going. No matter what!